The 41-year-old Santos entered Fayette on Feb. 12, 2012, as a healthy man, both physically and mentally. He was serving a five-to-10-year sentence for selling cocaine in his hometown of Harrisburg, Pennsylvania. He stood 5 feet 8 inches and weighed 164 pounds. The only medication he ever took was a daily dose of Lisinopril, meant to curb his high blood pressure. He prided himself o n his body, his muscles. Untended piles of coal waste can pollute the local environment, so in 1996, the Pennsylvania Department of Environmental Protection, along with a local company, Matt Canestrale Contracting, began dumping coal ash onto the site. In theory, this process–known as coal ash reclamation–should stabilize the local ecosystem. However, environmentalists are notably more wary about this idea. Fayette is not the only prison built next to a potentially toxic dump site. In fact, it’s something of a trend. Paul Wright, the director of the Human Rights Defense Center (HRDC), says building prisons near dump sites has happened for the last 15 years, if not longer, “even though the media has ignored it.” Wright, working with Prison Ecology, a project that grew out of the HRDC, is currently fighting the U.S. Bureau of Prisons, which is planning to build a new federal prison in Letcher County, Kentucky, right on top of a former coal mine. Wright says there’s a reason former coal towns welcome prisons: money. The declining coal industry has left scores of rural, economically impoverished towns. That decline, coupled with the fact that the United States was opening a new prison every 15 days throughout the ’90s, created a toxic mix. On my recent visit to LaBelle, I met with Jim and Candy Harvey, who live in the area. We sat on a wooden bench in front of the local firehouse, overlooking an abandoned baseball field. The Harveys recently moved out of LaBelle to another small town up the Monongahela River, but their children and three grandchildren live in their old home in the center of town. Candy’s grandchildren, she said, are always getting sick. “I call them Typhoid Mary and Fred,” she said, looking wistfully over the abandoned field. “They’re sick all the time.” Jim says that in the summer months he’d see a black film settle on the surface of their above-ground pool. On June 26, 2013, the Citizens Coal Council, a coal industry watchdog, filed a lawsuit against Matt Canestrale Contracting (MCC), the company that owns and manages the coal ash dump site. The lawsuit alleges that both the air and water had become polluted in LaBelle, and that MCC was liable because of the company’s “failure to cover trucks hauling coal ash waste,” which created fugitive dust in the area. It also noted that the state Department of Environmental Protection (DEP) had issued notices of violation to MCC nine times in the period from 1999 to 2012. Jim and Candy Harvey don’t buy it. They believe that everyone in the area is affected, including residents, inmates and prison guards. In April 2015, the couple created an organization called Helping Organize to Protect our Environment, or HOPE, and invited residents to attend a documentary screening about coal ash. They’re even in the process of sending out health surveys to town residents and plan to share the results with government health officials. A program came on that caught his attention. It was the Christian Broadcasting Network, and the channel was airing a news segment about coal ash in LaBelle, Pennsylvania, the exact site where Fayette was built. One resident interviewed, Sonny Markish, told the interviewer that he and his wife had battled cancer. He showed the side of his home, blanketed in a black dust, which he claimed tested positive for coal ash. Another couple interviewed, Rudy and Yma Smith, were both on kidney dialysis. After watching the segment, Santos decided to write a few letters to people who might be able to help. He sent one to the Human Rights Coalition (HRC), an advocacy group that fights for civil rights for prisoners. In the letter, Santos described his symptoms, the proximity of the prison’s location to the coal ash dump and how many of his fellow inmates, as well as local LaBelle residents and prison guards, seemed to be getting sick. Santos didn’t know it at the time, but that letter would trigger a series of events that would ultimately lead to a massive health survey of the prison, a survey that is still going on to this day. More than 81 percent of responding prisoners reported respiratory, throat and sinus conditions. Though the results were anecdotal, they seemed to confirm McDaniel’s fears. “We know there’s a problem,” McDaniel told me recently. 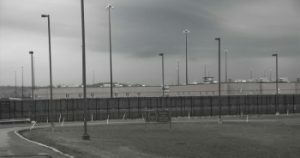 Since September 2014, McDaniel has been filing dozens of right-to-know requests with the Pennsylvania Department of Corrections about air quality in the prison. One of them shows that particulate matter in the prison air was over safe standards on one day in 2010. “Based on the types of cancer observed and the rates, there isn’t an indication the environment contributes to the risk, and there are no environmental data demonstrating human exposures to significant levels of carcinogens that could increase the cancer risk,” the report concluded. In the following weeks, the allergy tests came back negative, and by the time Santos was back in his office on Feb. 2, Skoner was extremely concerned. The symptoms persisted, and he feared Santos’ conditions might get worse over time. Finally, after filing grievances, sending letters and hoping Santos could be moved, Skoner submitted the paperwork, and Santos was transferred to a state prison in Smithfield, Pennsylvania, about three hours northeast of LaBelle. During his investigation, McDaniel set out to understand why a prison would be built near a dump site in the first place. According to county records, Matt Canestrale Contracting, which was incorporated in 1975 by Matt Canestrale, first bought the entire 1,327-acre plot of land in 1996. The dump site was later restricted to a 506-acre portion of the land. In 2000, Canestrale sold 237 acres back to the Commonwealth of Pennsylvania for $575,000. Around the same time, the Pennsylvania government was closing an inner-city prison in Pittsburgh, and the DOC was looking for real estate to build their next facility. Essentially, the DOC needed land, and LaBelle was cheap, poor and needed the jobs. In 2003, when Fayette opened, local news articles seemed hopeful the prison would bring the economically depressed area much-needed work. “Fayette residents hope prison holds promise of better future,” read one local headline. The article promised 700 new jobs for area residents. It did not mention the prison’s proximity to the coal ash dump site. This is not easy work. Some inmates are scared of retribution if they participate. McDaniel says that at least five or six inmates have sent surveys to him indirectly, through relatives, just so prison officials don’t see that they’re corresponding directly with McDaniel. Marcus Santos is dressed in black jeans, a gray Henley and a black baseball hat. He has a pencil-thin chinstrap beard that seems to match the contours of his smile. “You hungry?” Santos asks me. We’re in Above Da Rim, a car shop in Harrisburg, Pennsylvania. Santos says that within six months at Smithfield, his symptoms started going away. Within a year, he says, he was back at “95 percent.” He’s now at full health. In March 2015, Santos was granted parole. He’s now adjusting to life outside the prison, spending time with his son and family, and figuring out how to make phone calls on his new Samsung smartphone. “Phones got big again, man,” he says, a grin plastered on his face. He even went on a date recently. Despite Santos’ months of agony, filing grievances, sending letters, documenting his symptoms and fighting for his life, it was Skoner who ultimately convinced the prison officials to transfer him.